The core task of global human resource management at HUGO BOSS is to recruit, retain and develop the best employees for the Group in order to contribute to the corporate vision of being the most desirable fashion & lifestyle brand in the premium segment. The five corporate values – quality, passion, respect, cooperation and innovation – form the principles underlying daily working relationships and describe the corporate culture. Increasing complexity and a fast-moving competitive environment inevitably lead to a shortage of skilled employees and executives. In order to overcome bottlenecks, HUGO BOSS increasingly relies on actively approaching suitable candidates as part of its recruitment strategy. This allows the Company to identify potential employees more quickly and to bind them to the Company even before the actual application is submitted. The aim is to work through a growing network of qualified candidates to fill vacancies in a timely manner and to raise the Company’s profile as an employer. HUGO BOSS is increasingly relying on the further development of digital communication channels to contact potential applicants and position itself as an attractive employer. The prerequisite for this was already created in 2018 as part of the employer branding campaign “That’s my HUGO BOSS.” In addition, HUGO BOSS pursues active reputation management on relevant rating platforms and social networks. In addition to its digital presence, HUGO BOSS presents itself to potential applicants through talks and workshops at its Metzingen location and at career fairs. In addition to hiring college graduates and experienced professionals, vocational training continues to be a high priority at HUGO BOSS. The Company had 79 apprentices and university students last year (2017: 75). 31 new apprentices and students began their training in 2018 (2017: 29). In order to ensure the availability of suitably qualified staff in the strategically important areas of digital and IT in the long term, professional education will be widened to include commercial apprenticeships for e-commerce and the dual course of studies, “Data Science,” starting in 2019. The attractiveness of HUGO BOSS as an employer was awarded several prizes in 2018. The Company is again among the top 100 most attractive employers in Germany in the annual survey conducted by the “Universum” and “trendence” institutes. HUGO BOSS is also in the top ten companies in the “Working in Fashion” study conducted by the German industry magazine Textilwirtschaft. It scored particularly well in career opportunities, salary levels and working internationally. In addition, HUGO BOSS is rated among the top LinkedIn companies for interesting jobs, employee interest, employee commitment and employee loyalty. HUGO BOSS has conducted employee surveys on an annual basis since 2015. The knowledge gained provides the Company with an important impetus for the further development of its human resource management and the corporate culture. With a participation rate of 66% (2017: 66%), overall satisfaction throughout the Group stood at 68% (2017: 70%). 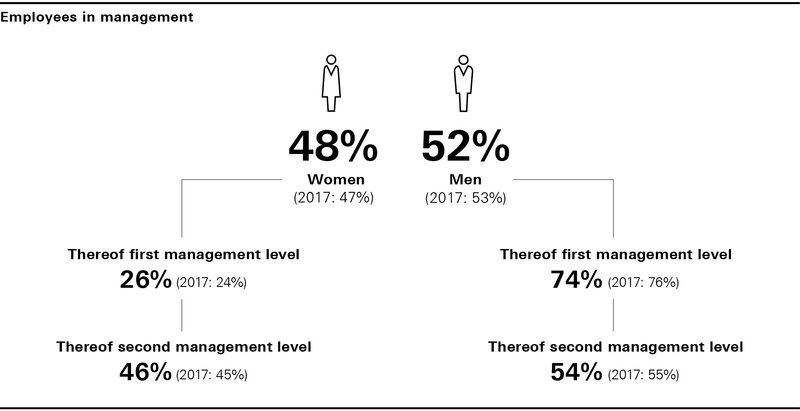 At HUGO BOSS AG, an overall satisfaction of 74% was recorded (2017: 77%). Once again, HUGO BOSS achieved a good result in comparison to participating companies in Germany. HUGO BOSS has introduced the “New Ways of Working” project on its Metzingen campus to enable more flexible and cross-functional work. Within the scope of the project, most departments were converted to a new and more flexible room layout. In addition, the individual part-time model and the home office concept were further rolled out. The number of employees who make use of the offer amounted to roughly 1,100 in 2018, meaning that it has doubled within one year. HUGO BOSS attaches great importance to the health of its employees. The Company offers a large number of sports activities. Employees can use the Company’s gym at the Metzingen headquarters, for example, and take part in a broad range of different sports courses. In addition, nutrition counseling, well-balanced menus in the company restaurant and relaxation courses all support personal well-being and promote the performance of employees. In 2018, the long-term implementation of health measures at the central warehouse sites pushed ahead. Massages, breaks for movement and back courses are offered at almost all warehouse locations. In 2018, the extensive health promotion measures received the Corporate Health Award in the highest category, “Excellent,” making them one of the best in Germany. The great commitment of the Company to health management was also awarded as “Best in Class” in the Dow Jones Sustainability Index 2018 in the category of Occupational Health & Safety. The executive promotion program continued to be expanded in 2018. After the successful launch of the employee development program for potential professionals and executives in 2017, the number of participants doubled to around 100 in 2018, and the program was rolled out at all European sites. Furthermore, the involvement of executives in the further training measures leads to a sustainable transfer of knowledge and a strengthening of the ties between employees and executives. In order to design the selection and promotion process even more fairly and transparently in future, a project was launched in 2018 – in a collaboration between executives, employees and the central HR department – with the aim of developing a data-based, transparent decision-making process. This can be viewed by any employees at any time. To test out the new procedure, three test groups were successfully implemented in 2018 for the selection and promotion of future department heads. Face-to-face training sessions and workplace orientations are an integral part of initiating industrial staff at the Company’s own production and logistics sites. All administrative and retail staff regularly take part in online training courses on the topics of occupational health and safety. At the end of fiscal year 2018, HUGO BOSS had 14,685 employees. The increase in the number of employees reflects the Company’s increased activities in the areas of retail, IT, digital and own production. The average age is 36 years and has thus increased slightly compared to the prior year (2017: 35 years). The Company’s global positioning is also reflected in the employee numbers. Last fiscal year, 79% of the Group’s employees were based outside Germany (2017: 79%). Whereas 10,067 employees (2017: 9,683) of the total workforce worked in the commercial and administrative sector at the end of 2018, 4,618 employees (2017: 4,302) were assigned to industrial activities.